Received this in my email today from McDSP. I previously posted about their incredible 6030 Compressor. Now would be a great time to purchase it. McDSP users, have we got a special for you! 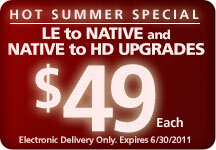 From June 22-30 upgrade any Native plug-in to HD or any LE plug-in to Naive for just $49 each! This is an amazing deal that won't last long! By upgrading your Native plug-in to HD you will not only receive TDM support, but you will also acquire all the latest v5 additions (Audio Unit Support, updates etc). For our LE customers, when you upgrade to Native you will add full feature functionality and Audio Unit support, but also additional plug-ins - a total of 27 plug-ins across all 7 LE to Native upgrades. For a complete guide to upgrading from LE to Native, please visit the Project Studio Upgrade Comparison Chart. 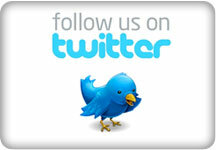 Special available only via electronic delivery. Offer valid June 22 through 30, 2011. It's summer time, so we're heating it up with more specials which means more savings! 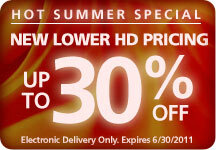 From June 22-30 purchase any individual HD plug-in for up to 30% off! HD products include the 6030 Ultimate Compressor, 4020 Retro EQ, 4030 Retro Compressor, 4040 Retro Limiter, Analog Channel, Channel G, Channel G Compact, Channel G Surround, CompressorBank, DE555, FilterBank, FutzBox, MC2000, ML4000 and NF575! For even more savings check out the HD Emerald Pack,Classic Pack and Retro Pack bundles! Special available only via electronic delivery. Offer valid through June 30, 2011. 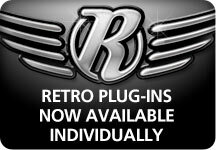 McDSP's vintage Retro Pack plug-ins are now available individually! Plug-ins include HD and Native versions of the 4020 Retro EQ, the 4030 Retro Compressor and the 4040 Retro Limiter. Retro plug-ins are designed for the ultimate vintage vibe, using new and original designs based on McDSP's decade of industry experience. 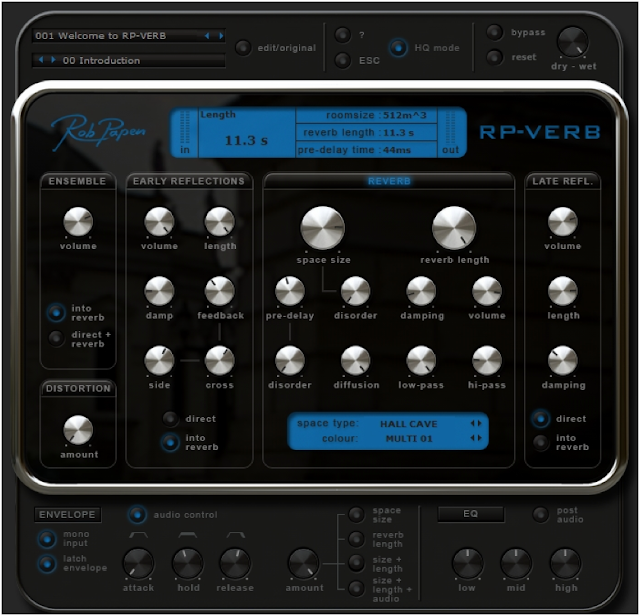 Retro plug-ins are a line of 'classics' that can live up to their own name without emulating something else. "Rob Papen's RP-Verb is a through-back style of reverb with some truly modern twists. It invokes an era of music production when engineers were less concerned with the realism of the reverbs they used and more focused on the musicality of their mixes. If that describes you, then RP-Verb may be just the golden bullet you're looking for. " When you purchase the RP-Verb you automatically get the RP-Delay also. 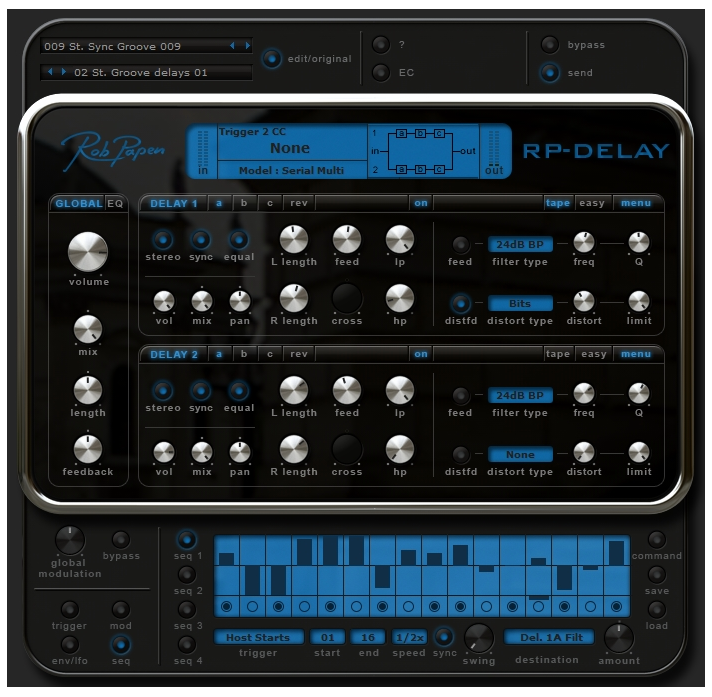 "The RP-Delay is a unique delay with some very special features. For instance, the sound reverser can reverse the input, while simultaneously reversing one of the delay lines.The reverse sound can also be triggered with your keyboard, generating totally new sounds, and sending them into the reverser with its own filter and distortion."